National Library (available only in English) by Evgeni Radushev, Svetlana Ivanova, Rumen Kovachev was published in 2003, but is still available for sale at the bookstore inside the Bulgarian National Library. You could also contact us at in order to obtain a copy. For more than a century Ottoman scholarship (and particularly that branch of it which deals with the socioeconomic history of the empire) has deemed TIMAR the basis of Ottoman agrarian system. The timar was – and still is, the object of numerous studies, more and more detailed and exhaustive. Summarised in the general courses on Ottoman history, they have led to the understanding that timar landholding was the most representative of the agrarian structure of the empire, and that all its other components, as far as they existed at all, were of less importance. The reason for such a widespread belief lay mainly with the accessible source basis – the numerous and very detailed kanunnames which regulated the relations among the central authority, the spahis and the reaya, the equally numerous timar registers, and the kadı sicills. Thus, the very sources directed research towards the “timar theme”, and indeed exhausted it as a problem. Another topic, however, much more important and turning upside down our ideas about Ottoman socioeconomic history, remained in the deep shade, that is, the WAQF. It is difficult to say that the sources for the study of the waqf have been sparse. Suffice it to mention the impressive body included in the Vakıflar Dergisi, of which so far twenty-one volumes have been issued. The pilot works of I. H. Uzunçarşılı and Ö. L. Barkan, sometimes lacking in conclusions due to the fact that their object had not been sufficiently studied, should have led us to the thought that the waqf institution was hiding an entire socioeconomic universe that had remained outside the scope of the Ottoman secular legislation while the Sheriat discusses it in only most general terms. Even the theoretical study of J. Krčmarik published in 1891 and based in particular on the Sheriat regulations about waqf according to the Hanefite school does not form a true idea about the real place and role of this institution in the world of Islam. The categorical view of Marx about the Ottoman empire as a “military-feudal” state, that is timar in its essence, also contributed to the divergence of research interest from the waqf topic. Some early attempts to treat the waqf at least on an equal basis with the timar in the Ottoman agrarian system were not adopted and not only in Bulgaria. This is proven again and again by the latest courses on the history of the Ottoman empire and of the Balkan peoples under Ottoman rule. Indeed, we witness a very promising turn, even a leap forward in our understanding of the socioeconomic history of the Ottomans – the introduction of the waqf as an essential component of the Ottoman structure. In the course of the research it may even turn out that waqf had been the determinant element in real Ottoman macroeconomy, or at least during the 15th-17th centuries, the so-called “classical period”. Even at that time the empire had not been “military-feudal”, not to speak of later times when it became simply feudal. Within the context of the entire imperial life waqf was what today we term as the “private secor”, “free initiative”, or “market economy”. The future research on waqf will be carried out thanks to some positive changes in the field of Ottoman studies. First, with the emergence of a new generation of specialists the Bulgarian school in the Ottoman studies, which enjoys international recognition, has evolved further. Second, the relations between the Chief Directorate of the Archives and the Oriental Department at the National Library in Sofia on the one side, and the Turkish Directorate of Archives on the other, have improved. This allowed the acquisition of thousands of documents which would permit the further research into the waqf. Now no obstacles exist in front of the broad research work on the problem, there are also qualified specialists. 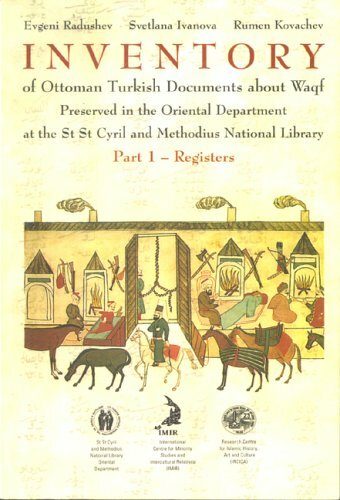 Their significant contribution is this Inventory of Ottoman Turkish Documents about Waqf Preserved in the Oriental Department at the St St Cyril and Methodius National Library, compiled by the senior research fellows Svetlana Ivanova, Rumen Kovachev and Evgeniy Radushev. As usual, research begins with the investigation into and announcement of the material. This has been carried out with a commendable competence by the authors, who have concentrated their efforts on the so-called “mass material”, the registers and series of waqf documents compiled in the form of deste and two specialised kadı waqf sicills. However precious the single documents are, even when in a great number, it is the mass material that provides possibilities for reliable conclusions on the subject. The word ‘inventory’ in the title does not fully correspond to the contents of the volume. In the first place, in it the listing of the archival units and their call marks, usually sufficient for an inventory, is accompanied by a detailed annotation of each unit. Such an approach would allow access to the data contained in the registers even to a non-specialist in Ottoman studies. And these are really abound in information, especially about the location of the land waqfs on the territory of the Balkans and Anatolia, about their founders, the types of waqf properties, about toponyms and onomastics, the salaries of the waqf functionaries, market prices and the enterprises of various waqfs, drawing a really broad and detailed picture of life in the empire and providing information about a number of earlier unelucidated problems. The material is also of marked importance about local history. As is well known, until recently the history of a given settlement was very difficult to reconstruct for lack of reliable data about its belonging to one or another type of agrarian structure, about the number and composition of the urban population, the means of livelihood or religious affiliation of the inhabitants. The waqf registers, and the Ruse waqf sicill in particular, shed light on numerous still open questions in the field of microhistory, and, in the final analysis, about Balkan and Anatolian realities of the 15th through the 19th centuries. The material offered here is invaluable in this respect. We may only envy the scholars that would embark upon it. which is again very important for local history. These biographical data are in themselves important for the “inner” history of the Empire, revealing the role of a great number of Ottoman aristocrats and notables for the development of various towns or regions. This index may well also become an entertaining reading for lovers of history as it contains short lives of military commanders, religious functionaries, sultans’ wives, eunuchs and other exoticism. Not as entertaining but still very useful is the index of geographic places where the reader finds the identified Ottoman and modern names of villages and mahalles. Specialists know very well what efforts requires such an otherwise small in volume index and what information it provides. Not less labour-consuming has been the compilation of the subject matter index which considerably facilitates the utilisation of the material for a given theme. The number of the realia included in it is exhaustive and strikes with its diversity. By a tradition, brought about by necessity, the volume concludes with a glossary of terms. It saves time to anyone who wants to use the material, but also allows avoiding the numerous, not always precise translations or explanations put in brackets. This glossary may be of use in the reading of any work in the field of Ottoman studies. Finally, I should add that the Inventory is being published in English which will make it accessible to the whole international community of Ottoman specialists. We hope that it will soon earn its deserved place among the sources on the socioeconomic history of Turkey.